This is essentially Psalm 18:30, word for word; because the Psalm of David as recorded in 2 Samuel 22 is almost entirely replicated in Psalm 18 as well. These are two significantly-lengthed chapters (51 and 50 verses each) that are almost an exact copy of each other – this is not something that’s rare in the Bible – 2 Kings 19 and Isaiah 37 are pretty much the same, there are some Psalms that are more or less a copy of each other; and there are many more passages or parts of stories in the Bible that are recorded more than once by various authors. I don’t think there will be much of a difference in the way I study these verses, since they have the same context, just recorded in two different places. Or perhaps a more accurate way of putting it would be that Psalm 18 is 2 Sam 22 – David’s Psalm – tidied up a little to suit the needs of the people for worshipping. I simply picked the one in 2 Sam because I saw that first – 2 Samuel continues on from where 1 Samuel left off, and David is finally the King proper and we are given the details of his very prosperous days – but yet not without sin, misery and darkness. This psalm was a psalm of reflection for David, as he comes towards the end of his reign, and 2 Sam 22, together with 2 Sam 23, which was probably his last psalm, can be considered as an appraisal of God’s hand on his life as the King of Israel. In this study, we will examine the divine empowerment of God as expressed in three simple phrases by a reflective King David. As for God – You might have noticed that it is typical in psalms for the psalmists to switch between the third person and the second person, when addressing God. This would have been very annoying in a normal prose or narrative, but because it’s a psalm, it somehow fits. I’ve seen a very apt description of this technique – you can’t go too long talking about God without talking to God. In verse 31, David switches back to talk about God, reflecting on what God has done for him as he stated in his prior few verses [26-30]. his way is perfect – God’s perfection is one that has been constantly mentioned throughout the Bible – from the Old Testament to the New Testament, from the times of Kings to the times of apostles. It is a constant. It is a fact. It is never going to change. God is eternally perfect. He is the Rock, his works are perfect, and all his ways are just. A faithful God who does no wrong, upright and just is he [Deu 32:4]. the word of the Lord is flawless – flawless would be another word for perfect, though in some versions we see the idea that the word of the Lord is tried or proven – and indeed so, isn’t it? Especially in our time. Many of the great prophecies that were written in the Bible have already been fulfilled – take the example of 1948 Israel’s independence as a single, united nation, close to 2000 years after its destruction in the early ADs. You can find prophecies on this topic in several parts of the Bible, but one of the main prophets who prophesied about this was Ezekiel, who lived approximately 2600 years before 1948. This is what the Sovereign Lord says: I will take the Israelites out of the nations where they have gone. I will gather them from all around and bring them back into their own land. I will make them one nation in the land, on the mountains of Israel.There will be one king over all of them and they will never again be two nations or be divided into two kingdoms [Eze 37:21-22]. It came true, didn’t it? From all around the world, Israelites returned to their own land and became a nation again. Imagine if you were reading this prophecy as late as in the 19th century. Even then, this would have been deemed impossible. But the word of the Lord is flawless. It is tried, and has been proven true. It has stood firm over the generations; and has held true over milleniums. Even more so, today science has caught up sufficiently for many of the end times prophecies to make sense. Granted, there are still many mysteries in the Bible. But the word of the Lord is flawless – as unimaginable or as impossible as some prophecies may seem, surely God has his own amazing plans for them. And the words of the LORD are flawless, like silver refined in a furnace of clay, purified seven times [Psalm 12:6]. We’re not just talking about prophecies of course, when we look at the word of the Lord. But it is probably a lot easier to accept that the commands and instructions are true and perfect – at least easier than it is for us to accept some of the prophecies, which at times seem out of the world. Well, let us pray for the spirit of wisdom and revelation [Ephesians 1:17|Article] as we read his word, which is flawless. He is a shield for all who take refuge in him – think about the life of David and how he must have felt when he reflected on his life and said, God is a shield for all who take refuge in him. When Saul wanted to kill him, David sought refuge in the Lord, and God protected him. When Absalom rebelled against him, David sought refuge in the Lord, and God protected him. When David sinned against Bathsheba and her husband, he turned back to the Lord and God led him through repentance and ultimately, restoration. 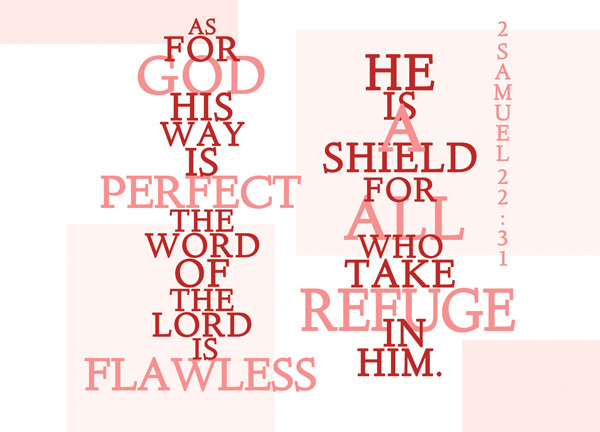 The Lord is a shield for all who take refuge in him – the key here is, you have to take refuge in the Lord. You have to turn to God. Do so, and no matter the baggage that you’ve brought with you, the Lord will lead you through it. He will cover you with his feathers, and under his wings you will find refuge; his faithfulness will be your shield and rampart [Psalm 91:4]. There are plenty of verses that echoes the sentiments in this verse. In fact, it’s so common that we can even find an exact replica of this verse in its entirety in Psalm 18:30. What does that tell us? What does that mean? The Bible was written across a span of a very long time, and since it was written, it’s been a long time as well – but there’s no time scale to the Bible. It stays perfect, just as God stays perfect throughout time. No matter when, no matter where, no matter who – if you would just take refuge in the Lord, he will be a shield for you. There’s no time scale to it. And no matter how many times we hear it, it remains true and equally comforting to us.